Between-the-lines message of the recently released (and hyped to death) Conservation Management Plan for polar bears by the US Fish & Wildlife Service is that the bears really have nothing to worry about except human-caused global warming but it will cost tens of millions of dollars over the next five years to study and manage them. So filled with double-speak, misinformation, and obfuscation [including the newly-invented term, “quasi-extinction floor”] that it’s no wonder some news outlets got it wrong (nowhere in this document does it say that “polar bears might go extinct within ten years“). The document does, however, lay out the FWS budget for polar bears over the next five years – and it’s a real eye-opener. What the report does is assure the FWS funds, over the next five years, to continue spreading alarm regarding greenhouse gases, continue their current and planned polar bear subsistence harvest management plans, and make additional plans to deal with polar bear problems that may or may not arise. All based on models of predicted summer sea ice losses over the next 100 years (when they say “sea ice” they mean “summer sea ice” – see recent post here). [Press release here; Report here (pdf here); Handy, fear-mongering-about-the-future summary provided by USGS here; Sustainable harvesting management plan summary here; “Questions & Answers” about report here). The bulk of the budget funds will go towards polar bear biologists and population modelers – more than $28 million (pg. 49). Oddly, the budget item for sea ice modeling (excuse me “projections”) is tucked into the “Diseases & Parasites” section (which are “not currently a threat to recovery”) and allocated an additional $3.45 million (pg. 50), while “den detection mapping, and habitat work” (which surely is routine field work?) is listed separately for an additional $4.433 million (pg. 46). This means the real total for biologists and modelers is in excess of $35 million – more than half of the $64.6 million total allocated for polar bear related study and management over the next 5 years. Actually, the most recent assessment by the PBSG was made in 2014 (11 July) but only appears on their website, not in a published document (the PBSG have decided to abandon that out-dated format – who publishes things as documents anymore?). That statement gave a “mid-point estimate” of “approximately 25,000.” (see previous post discussion here; pdf of PBSG statement here). The mid-point of 20,000-25,000 from 2010 is only 22,5000, so the USFWS quoted estimate in this 2015 document is well below the most recent accepted figure made in 2014. Why would they do that, I wonder? The IUCN PBSG won’t hazard a guess any more as to how many polar bears live in the Chukchi Sea because that would be “unscientific” but the USFWS is happy to go with an estimate of about 2,000 because otherwise, the US would have only about 450 polar bears to manage (their half of the estimated 900 bears in the Southern Beaufort, shared with Canada). Plus, some of their models require a number. “4. 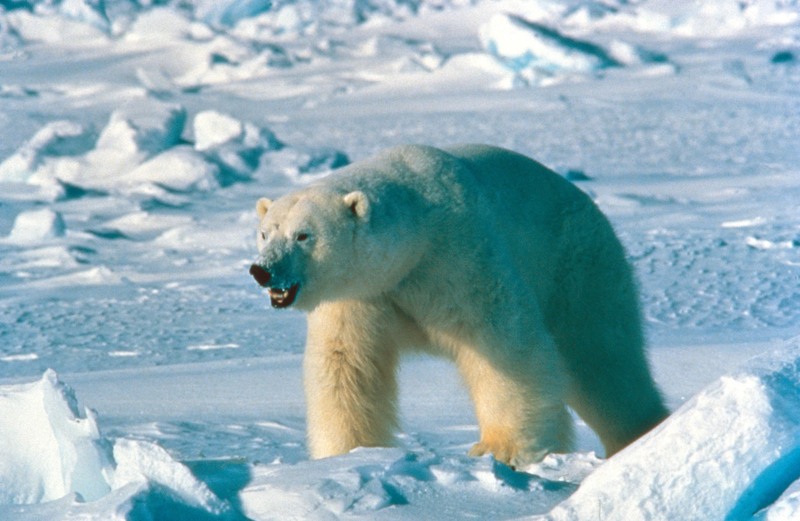 How many polar bears are in the U.S. part of the range? That last sentence gives the impression that the US has about 3,000 bears to manage but in reality it is less than half that, about 1,450 bears. “5. What is the projection for the population in the U.S. part of the range – are they expected to go extinct? If so, when? We do not have projections that are specific to the U.S. Based on population dynamics data collected 2001-2006 (Regehr et al. 2010), Hunter et al. (2010) estimated a high probability that the Southern Beaufort Sea subpopulation would face severe reductions by the end of the 21st century, and possibly by mid-century. This was based on a correlation between reduced sea ice and reduced survival and breeding during from 2001-2006, combined with projected sea-ice conditions from global climate models. A more recent study for the Southern Beaufort Sea covering the years 2001-2010 (Bromaghin et al. 2015) indicated a more complex relationship between ice and population dynamics. Projections for the Southern Beaufort Sea subpopulation have not yet been updated in light of Bromaghin et al. (2015), although the expected risk of extirpation likely remains high. No projections exist for the Chukchi Sea subpopulation. However, a comparison of 1986-1994 with 2008-2011 data indicated very similar body condition and productivity (such as number of yearlings per female) despite sea-ice loss (Rode et al. 2014). So, a fifty-fifty chance of a reduced population (not specified by how much) within 10 years. Not extinction. But they still need more than $64 million over the next five years to keep an eye on the problem. Modern conservation “science” – what else needs to be said? Fat bears on land in the Southern Beaufort, Sue Miller photo, well-prepared for a brief summer fast. This entry was posted in Advocacy, Population, Sea ice habitat and tagged 5 year plan, Alaska, budget, Chukchi Sea, climate change, costs, global warming, greenhouse gases, habitat, management, polar bear, polar bear science, population estimate, science, sea ice, Southern Beaufort, US Fish and Wildlife Service, USGS. Bookmark the permalink.